2013 IMA CPV15 Case Packer Erector For Packaging Pharmaceuticals Cosmetics Foods . New Life Scientific, Inc.
-->Suitable for integration in an existing system. 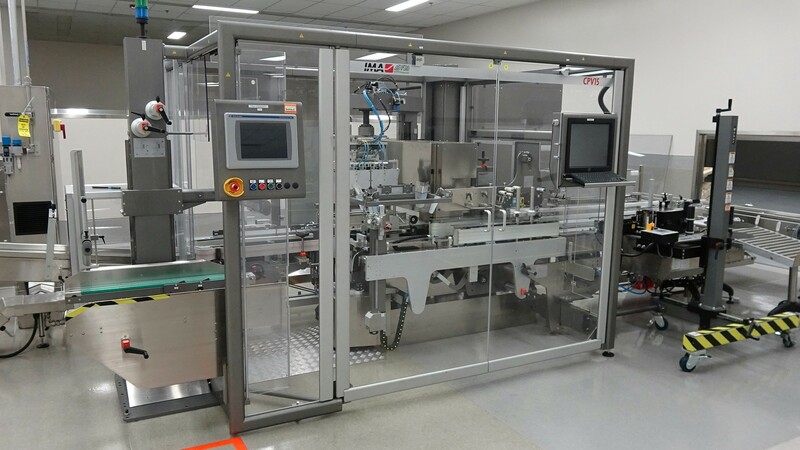 New Life Scientific technicians acquired this top loading case packer with two pharmaceutical packaging lines, shipped directly from the US pharma manufacturer. This stainless steel system was received in pristine condition and included all required cabling, cords, and features multiple accessories. There are easy adjustment switches for advanced changes dependent on your packaging needs. The case packer is ideal for a customer that wants to incorporate packaging into their current processing line. The technicians consulted a PLC professional to properly power, connect, and control the pharmaceutical packaging line. The case packer infeed manages loose or bundled products and places them in packaging boxes. The technicians used blank boxes and packaging materials to test the case packer's ability to function, noting it works remarkably well. The packer can unfold, pack, close, and tape the box. Please see the product overview, specifics, and advertised description on IMA's CPV15 page. Please contact New Life Scientific, Inc. for more information regarding testing, photographs, and information about the IMA packaging equipment. This product will require professional integration in your facility and NLS staff has made extensive contact with US-based installation companies and IMA; they might be able to provide service recommendations or requirements. The customer service department would be happy to discuss our professional packaging and arraing freight shipping options.